Michael A. Pizzi; Promoting Health, Well-Being, and Quality of Life for Children Who Are Overweight or Obese and Their Families. Am J Occup Ther 2016;70(5):7005170010p1-7005170010p6. doi: 10.5014/ajot.2016.705001. Obesity is a complex, multidimensional challenge that compromises occupational participation for children and families. Children who are overweight or obese are at serious risk for being stigmatized, bullied, or marginalized, and they often are medically compromised. They cope daily with occupational participation issues at home, in school, on playgrounds, and in their communities. Prevention and health promotion assessment and intervention in occupational therapy are imperative for the profession to make a significant and sustainable difference in the lives of these children and families. Innovative client- and occupation-centered programming promotes health, well-being, and quality of life for this population. It is incumbent upon occupational therapy practitioners to prevent occupational marginalization, deprivation, and alienation while promoting occupational justice for children who are overweight or obese. Childhood and adult obesity has escalated to a national and worldwide epidemic. The statistics are remarkable (Table 1), and the escalation appears endless. It has become a public health issue, especially as the trajectory for being overweight or obese among children continues to climb. World Health Organization (WHO; 2016a) statistics demonstrate that globally, insufficient physical activity, one of the greatest contributors to childhood obesity, has become pandemic (Figure 1). Table Footer NoteNote. FPL = Federal Poverty Level. Table Footer NoteaData from Centers for Disease Control and Prevention (CDC), 2016a . Table Footer NotebData from CDC, 2016b . 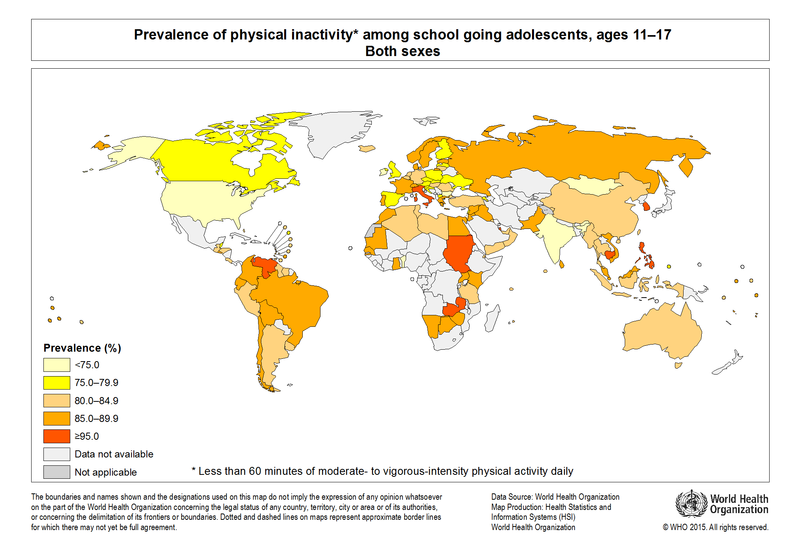 Prevalence of physical inactivity among children ages 11–17, by country. Note. Physical inactivity is defined as <60 min of moderate to vigorous physical activity daily. Source. Prevalence of Physical Activity Among School Going Adolescents, Ages 11–17: Both Sexes [online image], by World Health Organization, 2016, Geneva: Author. Retrieved from http://gamapserver.who.int/mapLibrary/Files/Maps/Global_InsufficientActivity_Adol_BothSexes_2010.png. Copyright © 2015 by the World Health Organization. Reprinted with permission. Psychological stress such as depression, behavioral problems, and issues in school. Low self-esteem and low self-reported quality of life. Impaired social, physical, and emotional functioning (para. 13). Children who are obese are more likely to become obese adults, with health consequences that include heart disease, diabetes, metabolic disorder, and cancer (Biro & Wien, 2010). Obesity in one parent is correlated with obesity in offspring; other factors that place children at risk for being overweight or obese include ethnicity, educational level of head of household, and family income level (CDC, 2015). Every occupation of childhood is affected by obesity, including occupational engagement and participation. Social and mental health issues include marginalization, stigmatization, being bullied, development of a negative self- and body image, poor social participation, and depression (CDC, 2015; Davison & Birch, 2001; Pizzi & Vroman, 2013; Puhl & Latner, 2007). Prejudicial attitudes among health professionals, including occupational therapists, can compromise service delivery (Vroman & Cote, 2011) . Many occupational therapy practitioners work with children with special needs, including physical, mental, and socioemotional challenges. Research indicates that more than 40% of children with a disability are at higher risk for being overweight or obese (Rimmer, Rowland, & Yamaki, 2007), and children with developmental delay are more likely to be overweight by age 3 than their nondisabled peers (Emerson, 2009; see also Bazyk & Winne, 2013). Reasoning through occupational issues related to children who are overweight or obese using systems thinking must also include use of public health models that emphasize prevention and health promotion. Bazyk’s (2011) work in the area of public health related to the mental health of children and adolescents has emphasized a three-tiered public health model for intervention while also advocating for a systems perspective. This model corresponds to the primary, secondary, and tertiary areas of prevention; is strengths based; and focuses on supporting all children coping with the challenges of being overweight or obese. Diversity training for students and teachers to eliminate bullying behaviors and weight bias. The Comfortable Cafeteria and Refreshing Recess programs are examples of embedded programs developed by occupational therapists that focus on healthy food choices, positive social interaction, and enjoyable active play (Every Moment Counts, 2013a, 2013b). Tier 2 involves targeted interventions or secondary prevention for children at risk for being overweight or obese. Some of the most at-risk children include those with disabilities and those living in poverty (CDC, 2015). These children often face occupational deprivation, marginalization, lack of access to healthy foods, limited opportunity for physical activity, and environmental demands not known to other children (Pizzi et al., 2014). Children at risk for being overweight or obese are also at risk for being bullied and stigmatized (Pizzi & Vroman, 2013; Puhl & Heuer, 2010; Puhl & Latner, 2007). Occupational therapy practitioners have the skills and knowledge to create prevention programs for at-risk children focused on social and recreational activity that promotes healthy eating, movement, and social participation in a stress-free and safe environment, both during and after school. To intervene at this level, enabling children's positive physical, mental, and social health, occupational therapy practitioners must be aware of the multiple factors that place children at risk. Tier 3 interventions involve more individualized activities correlating with tertiary prevention for children and youth who are already overweight or obese and who require direct intervention. This group requires more than functional and educational assessment; they require assessment focused on health and well-being, motivation to change a health behavior, and investment of family and individual time and effort to make that change in behavior. One such assessment tool is the Pizzi Healthy Weight Management Assessment (Pizzi, 2014), which has been used in several research and clinical studies; more occupation-based and health-focused assessments are needed to help meet society’s needs. Examples of targeted interventions include recommending culturally specific healthy routines, evaluating families’ cooking styles and food preferences, teaching home management strategies that promote health and well-being, and developing walking or dance programs for children and families that can easily be implemented daily. Above all else, occupational therapy practitioners must remain client centered throughout the process, incorporating all factors that will help each client sustain a lifelong commitment to improving health behaviors. Occupational therapy practitioners have done an exemplary job in the area of tertiary prevention, in which the role of rehabilitation specialists is appreciated. Much greater understanding of the occupational challenges and possibilities for positive health behavior change among communities and populations is necessary for the health care community to recognize occupational therapy as a major force toward change. The Institute of Medicine (IOM; 2012) report Accelerating Progress in Obesity Prevention discusses five major goals and provides recommendations, strategies, and action plans for obesity prevention. Occupational therapy has a significant opportunity to translate these goals to practice. Goal 1: Make Physical Activity an Integral and Routine Part of Life. Promoting physical activity through play and engaging children and adolescents in fun, interesting, and engaging activity that is grounded in moving and interacting with others is standard occupational therapy intervention for children with special needs. A commitment by practitioners to properly assess and intervene with children who are obese or overweight is necessary to ensure that all occupational and health needs are met for every child, including those who do not have special needs. It is vital to intervene early in children’s lives and to promote movement activities for individuals, communities, and populations. Education for children and their parents and caregivers about the health benefits of movement, intertwined with actual movement activity, is imperative to improve occupational health and prevent disease and disability for those who are overweight or obese. Goal 2: Create Food and Beverage Environments That Ensure Healthy Food and Beverage Options Are the Routine, Easy Choice. Occupational therapy practitioners work in homes, schools, and communities where children live, learn, and play. In each of these environments, education about what constitutes a healthy food source and which beverages are healthy and unhealthy for children can be an effective strategy to implement using occupation-based activity. Occupational therapy practitioners can make a difference by advocating (e.g., with legislators) for health policies on consumption of less sugary drinks, providing health education activities for families and schools about offering healthy snacks and less sugary drinks during snack times or play breaks, and creating Tier 1, 2, and 3 interventions that help children always choose the healthy option. Goal 3: Transform Messages About Physical Activity and Nutrition. Develop family education sessions, individual treatment sessions, and community-based workshops that educate through activity. It is also vital that practitioners and the profession transform messages about physical activity and nutrition using a health literacy approach in a way that helps the general public connect the messages with occupational engagement. For example, practitioners can provide families with fun strategies to help children eat healthier, and they can help society understand that play and any activity incorporating movement and occupational engagement improve health. As a profession, we must continue to create and provide powerful, positive health messages that link occupation to health and ensure that our message is made public through various media sources. Goal 4: Expand the Role of Health Care Providers, Insurers, and Employers in Obesity Prevention. Occupational therapy practitioners must help transform what is meant by early intervention and educate insurers that early intervention must include prevention, particularly with communities and populations. Practitioners can implement this goal by addressing childhood obesity and prevention through primary care practitioners including physicians, physician assistants, nurse practitioners, and all practitioners involved in any setting related to childhood obesity. Talking to and educating insurers about the benefits of occupation as prevention will continue the conversation that occupational therapy is a vital service. Finally, development of obesity prevention and health-related occupation-centered programs for schools and businesses can create new pathways for the profession to pursue. Goal 5: Make Schools a National Focal Point for Obesity Prevention. According to the 2015 American Occupational Therapy Association (AOTA) workforce and salary survey, 60.8% of occupational therapists work in school settings in direct intervention, and 13.7% work as school consultants. Pizzi and Orloff (2015) strongly suggested that anyone working in school systems begin to document and advocate for healthy weight management goals. Occupational therapy practitioners need to explore the impact of obesity on academic achievement, including school attendance, which is often diminished because of health problems related to being overweight or obese. When occupational therapy practitioners clearly and consistently articulate and document the link between healthy weight management and occupational participation in school, then children, their families, and their school systems and communities will better understand the power of occupation in children’s lives. Being knowledgeable about and advocating for increasing recess in schools can help all children achieve and maintain healthy weight (AOTA, 2012). Implement comprehensive programs that promote physical activity and reduce sedentary behaviors in children and adults. Integrate and strengthen guidance for noncommunicable disease prevention with current guidance for preconception and antenatal care to reduce the risk of childhood obesity. Provide guidance on, and support for, healthy diet, sleep and physical activity in early childhood to ensure children grow appropriately and develop healthy habits. Implement comprehensive programs that promote healthy school environments, health and nutrition literacy and physical activity in school age children and adolescents. Occupational therapy practitioners can strengthen the IOM and WHO goals and strategies by collaborating with colleagues and creating interdisciplinary programs. It is important to acknowledge the strengths and contributions of others working to address childhood obesity, such as nutritionists, physical therapy and nursing professionals, health educators, primary care personnel, psychologists, community organizers, social workers, and those in the creative arts professions. The onus is on the occupational therapy profession and practitioners to expand what we do and whom we collaborate with, to think outside the box, and to be creative and innovative to help meet this societal need. Preventive, proactive, and innovative approaches are needed to reduce the health impact of childhood obesity for all societies and populations (WHO, 2016b); “[t]hese innovative approaches need to consider the child’s occupational challenges in the context of multiple environments” (Pizzi & Orloff, 2015, p. 29). The occupational therapy profession needs to align itself with the health, well-being, and quality of life issues that affect society. Children who are overweight or obese are challenged in all of these areas on a daily basis, yet practitioners often overlook their health and wellness needs to meet only their functional or educational needs. Although this omission may be a result of school or reimbursement mandates, it is vital to address children’s overall health needs, which affect their functional and educational needs. Use of a systems perspective enables health through occupation. Attending to the child as a person with multiple occupational challenges and being aware of the impact of obesity on a child’s functional and educational needs can only strengthen the profession and practitioners’ assessments and interventions. Children who are overweight or obese are best served when they are viewed as occupational beings who participate in family, community, and society. Develop and implement family-centered care and education for families with parents and children who are overweight or obese. Interweave health promotion and prevention throughout all occupational therapy curricula related to obesity and healthy weight management. Create school-based occupational therapy interventions that meet the individualized education program and health and wellness needs of children who are obese or overweight. Create multilingual and culturally appropriate educational materials, in clear and understandable language, that explain the direct link between obesity and academic achievement. Develop fun and engaging community-based, occupation-centered after-school programs that enable physical activity and healthy food choices, some of which could also be family centered. It is imperative that occupational therapy practitioners engage in assessment and intervention of children who are overweight or obese using a public health framework, including assessment and intervention of family systems. Children do not play and participate in life in a vacuum, but rather must be viewed as being in constant interplay with families, schools, and communities, the environments in which they interact. The best program or intervention and outcome will never make a difference to the larger society, however, unless others are informed about the power of occupation. To meet the societal and global challenge of childhood obesity, the occupational therapy profession must be visible, produce evidence, and make it known how well we transform individual lives and communities. The future of each child depends on it. I acknowledge the collegiality and support of the AOTA Obesity Prevention and Health Promotion Work Group; Lorie Richards, AJOT editor-in-chief, who believed in the need for this special issue; and Susan Bazyk, for her review of this editorial. American Occupational Therapy Association. (2015). 2015 AOTA salary and workforce survey. Bethesda, MD: Author. Institute of Medicine. (2012). Accelerating progress in obesity prevention: Solving the weight of the nation. Washington, DC: National Academies Press. Kuczmarski, M., Reitz, S. M., & Pizzi, M. A. (2010). Weight management and obesity reduction. In M. Scaffa, S. M. Reitz, & M. A. Pizzi (Eds. ), Occupational therapy in the promotion of health and wellness (pp. 253–279). Philadelphia: F. A. Davis. Pizzi, M. A. (2014, April). Assessment in childhood obesity. Paper presented at the conference of the American Occupational Therapy Association, Indianapolis. Pizzi, M., & Orloff, S. (2015). Childhood obesity as an emerging area of practice for occupational therapists: A case report. New Zealand Journal of Occupational Therapy, 61, 29–38.